The Chicago tradition continues for the next generation of Cubs fans to experience. Tickets are available for individuals or groups looking to attend a Chicago Cubs game from this unique vantage point. Take part in a once in a lifetime event by watching a Chicago Cubs game from a Chicago Cubs Rooftop in Wrigleyville. 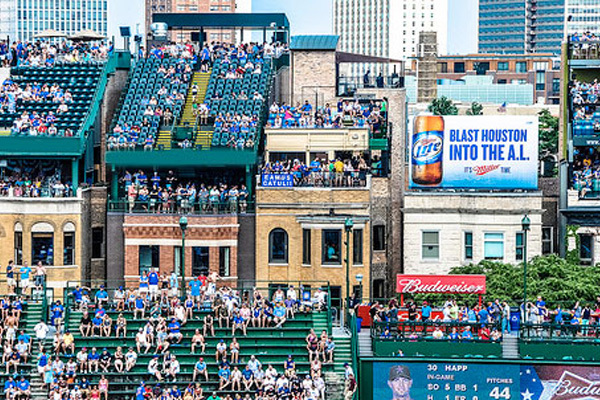 The experience of witnessing a game from a Cubs Rooftop is unlike any other. What is included in a Cubs Rooftop Game Package? Starting an hour prior to the game, enter the rooftop and enjoy bbq favorites grilled to order along with unlimited beer and wine, soft drinks and waters. When game time begins, the food and drinks keep flowing. How is the view from a rooftop today? Much has been written about the recent rooftop changes. Wrigley Field installed a jumbotron on one side of stadium, however, the view from our rooftops has not been obstructed from the other side. The atmosphere and excitement of attending a game from the rooftops are still fantastic. Call 1-888-654-7755 for more information. Rooftop tickets are available for groups of 1-200 guests.